The CB-10 doesn't blow any of its competitors out of the water as such, but for the money it's a great bass that any beginner should be delighted to play. Recommended. Well put together and a bright, punchy tone. You can mix the sound of the different pickups. Intonation is ever so slightly out on the highest frets. Doesn't have the kudos of some of its rivals. One of the most important factors when buying a bass is often the one thing a beginner ignores - what pickups to choose? For the most part, entry-level basses come equipped with either a split-coil humbucker or a pair of single coils - influenced by Fender's Precision and Jazz basses, respectively. But hey, why not have both? That's exactly what Black Knight CB-10 offers, pairing the aforementioned split humbucker in the neck position and a single coil towards the bridge. The advantage of this combo is that you get the best of both worlds. Split coil humbuckers are made so that half of the coils are closer to the neck and focus on the lower strings, while the other half concentrate on the upper strings, slightly closer to the bridge. This makes the low notes thicker and the high notes more cutting, combining for a more mid-heavy tone that's great for rock and works especially well with a pick. Jazz pickups, on the other hand, offer a thinner, funkier edge that works well for slap and, obviously enough, jazz. Mixing this sound with the humbucker adds a crisper attack to your sound that many bass players adore, and it's great to see this on such an affordable bass. All this would count for nought if the pickups weren't any good, of course, but thankfully, the Black Knight performs admirably given its price. You're not going to have the full dynamic range and detail of more expensive units, but this is a great place to start and we doubt any beginner would be left wanting. Playing with a pick produces an articulate sound with a great raunchy, chunky attack to it. Turning down the volume on either pickup unlocks even more options, letting you enjoy the simplicity of the humbucker approach or the funkier stylings of the single coil - especially handy if you're interested in learning a bit of slap bass. Aside from a solid set of pickups, the CB-10 has also been blessed with a quality setup and sturdy hardware, making for a great playing experience. The satin-finished neck is a breeze to motor around on, and all 24 frets have been smoothly polished and well-fitted. Unfortunately the intonation is ever so slightly out, but this is only starts to kick in around the very highest frets. It can be easily dialled out at home or at your local guitar emporium, and if you stick to the lower frets it's not likely to be a problem, anyway. The agathis body is lightweight but resonant, perfect for beginners and younger players who are getting used to their new instrument. The lower horn also has a generous cutaway, allowing easy access to all 24 frets. The whole thing feels very well put together and the CB-10 rings out with a really clear, bright and punchy tone even when being played acoustically. If there's anything this bass is lacking, it's star power. 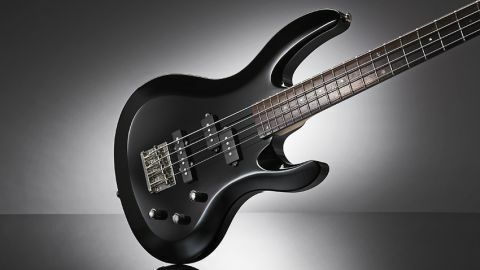 The Black Knight doesn't have the kudos and history of say, Fender, Ibanez, Yamaha or Peavey, and they all make excellent basses at similar price points. However, in our eyes the CB-10 has definitely earned its place amongst those illustrious names.